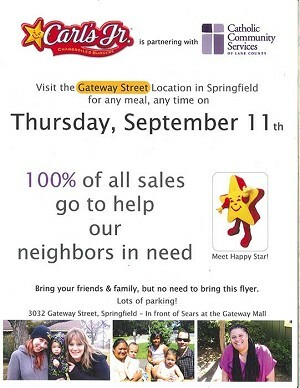 SPRINGFIELD — Carl's Jr. restaurant on 3032 Gateway St. here is teaming up with Catholic Community Services of Lane County to help neighbors in need. All day on Thursday, Sept. 11, all money from all sales at the burger place — in front of Sears at Gateway Mall — will go to the charitable organization. Catholic Community Services provides food and clothing to homeless and low-income people, gives emergency shelter, gives aid to prevent families from falling into homelessness, helps pay utility bills during cold season, amd counsels people on obtaining low-cost housing. The agency also offers transitional housing to help homeless people off the street, counsels families whose children are at risk of going into foster care and mentors young fathers.